I've been trying to get another pack of cards made & sent off to the SendASmile4Kids organization. My husband is actually working tomorrow part of the day, then coming home to cut the grass! Not much of a holiday, but we had not real plans anyway. So I'm going to concentrate on making a lot of cards tomorrow. I did manage to get a few fun cards done the last couple of days using Technique Tuesday's Felix the Frog stamp & die set. Below is one of those finished cards. I stamped Felix on some green designer paper then cut him out using the die. The striped paper & blue card stock were from my stash. I heat embossed in white the sentiment & cut it out using a stitched bubble die by Spellbinders. The white panel behind Felix was cut using a stitched square die. Then I added the two blue enamel dots from my stash. I thought it turned out pretty cute!! Thanks for stopping by to take a peek! How cute and fun! Thanks so much for playing Simon Says Stamp Wednesday “Anything Goes” Challenge! Beautiful colors and design. Well done! Love, love, LOVE your bright and simple card design, Patty! Really cute image. Love to see you playing in our "Anything Goes with a Critter" challenge at 2 Crafty Critter Crazies. We do love regular supporters. :-D Good luck in the draw. oh so SWEET! I love your sentiment with this darling little froggy. Pretty colors, and a wonderful design. So glad I got to see your critter project showcased at the 2 Crafty Critter Crazies Challenge. Thanks for supporting us, and we hope to see more of your pretty creations in the future. Please check back to see if you are a winner or our next guest designer. Sending you wishes for a wonderful day! So much fun! 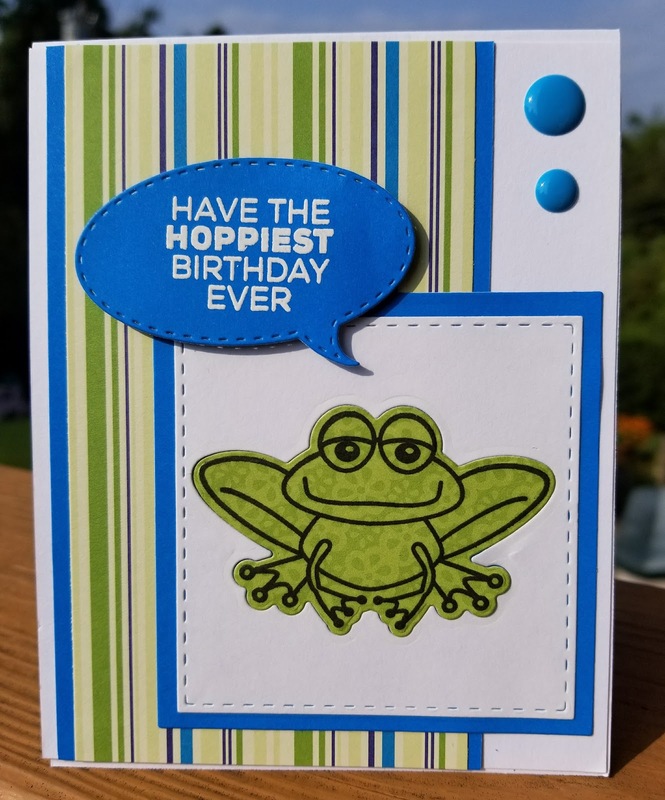 Love the cute frog and punny sentiment! Thanks for sharing at Jo's Scrap Shack!